Supporters of Brazilian former president Luiz Inacio Lula da Silva gather as the Supreme Court of Justice deliberates on whether Lula da Silva should start a 12 year prison sentence for corruption, in Brasilia, on April 4, 2018. On the eve of a critical ruling from Brazil’s highest court, the general in charge of the country’s army is being accused of sending a thinly veiled warning to the 11 judges on the top bench − and heightening tension about the role of the military in this still young democracy. 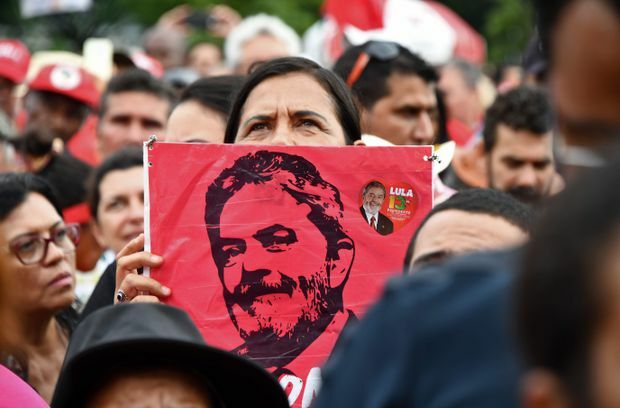 The Supreme Federal Tribunal is expected to rule late Wednesday or on Thursday on a petition from former president Luiz Inacio Lula da Silva to remain at liberty despite a 12-year prison sentence for corruption and money-laundering. The ruling will be a key factor in presidential elections later this year, and is perhaps the most important and politically divisive question to come before Brazil’s courts since the military dictatorship ended in 1985. Now an already polarized country has been set on edge by an unprecedented statement by General Eduardo Villas Boas, commander of the army. “In Brazil’s current situation, it is up to the institutions and citizens to ask who is really thinking of the well-being of our country and its future generations and who is only concerned about personal interests,” the general wrote late Tuesday night, adding that the military “shared the desire of all good citizens to repudiate impunity,” interpreted by many Brazilians as a warning to the court to reject Mr. da Silva’s petition and clear the path for him to be jailed. The law, as it stands, is clear − someone whose conviction for a felony has been upheld on appeal, as Mr. da Silva’s was in January, should be jailed. But Mr. da Silva maintains his innocence of this crime and others of which he is accused and has fought a long battle to avoid prison, arguing that his conviction is part of a campaign of political persecution and was intended to keep him from being able to stand in the October election, for which he is currently the top candidate in polls. The former president, once hugely popular nation-wide and now a divisive figure, was convicted last year of helping a construction company win government contracts in exchange for the promise of a beachfront apartment. He was found guilty by Sergio Moro, the crusading anti-corruption federal judge who oversees the vast Lava Jato investigation. Many Brazilians view Judge Moro as a rare champion of the public interest, but many of those on the left believe he has political motivations. The conviction of the former president was a landmark for Brazil, but even judicial scholars with no political sympathy for the leftist ex-president suggested the case against him was not strong. Mr. da Silva served as president from 2003 until 2010; he oversaw a period of economic boom and implemented a range of economic policies that helped dramatically reduce poverty in the country. However, the Lava Jato prosecutors argue that he also acted as the kingpin in a kickbacks-for-contracts scheme of unprecedented magnitude. The talk of potential military intervention has percolated here for more than a year. In February, President Michel Temer gave the armed forces control over security of the city of Rio de Janeiro, saying the step was needed to control a wave of violent crime (although in fact statistics showed crime was not appreciably higher than it had been a year before). It was the first such use of the military in public security since the dictatorship. But Brazilians’ disgust with a seemingly unending series of revelations about the venality of their elected leaders left some with nostalgia for military rule. The armed forces seized power here in 1964, saying they were acting to prevent the country’s descent into communism − and stayed in power for more than 20 years, with the generals at the top enriching themselves on a series of giant infrastructure contracts, a detail that is rarely discussed here today. The next-most-popular candidate in the polls after Mr. da Silva is Jair Bolsonaro, a far-right member of Congress who speaks often of his admiration for the dictatorship, has praised those who carried out torture and says police should have the right to shoot to kill those they suspect of criminal activity. He expressed warm support for Gen. Boas Villas’s remarks on Wednesday. But other public figures and institutions immediately criticized the general’s comments. “The mere contemplation of military intervention by some state agents and segments of civil society against the legitimate exercise of jurisdiction by the Supreme Federal Tribunal [shows] democratic consolidation in [Brazil] has not been completed,” the public prosecutor’s office said in a statement. President Temer has had a number of meetings lately with Gen. Boas Villas, with whom he is perceived to be close. He said in a statement that Brazilians must not “deviate from constitutional determinations” but also noted the right of free speech of those who would criticize institutions, an apparent reference to the general. When military leaders weigh in on political questions, they are demonstrating their fear of instability, Prof. Nascimento said − and in their perception, another government led by Mr. da Silva would be equivalent to instability. For the population at large, it’s something else, he said. ”The people who are saying they want military intervention are desperate because of violence and insecurity and corruption.” They are not seeking authoritarian rule as much as expressing frustration with their existing options, he added.